Rays of light from distant galaxies that began their long journey to Earth eight billion years ago, may hold the answer to one of the biggest mysteries in physics – why the expansion of the universe is speeding up. That ancient starlight has now found its way to a mountaintop in Chile, where the newly constructed Dark Energy Camera, the most powerful sky-mapping machine ever created, has captured and recorded it for the first time. Over five years, the survey will create detailed color images of one-eighth of the sky, or 5,000 square degrees, to discover and measure 300 million galaxies, 100,000 galaxy clusters and 4,000 supernovae. Scientists in the international Dark Energy Survey collaboration announced this week that the Dark Energy Camera, the product of eight years of planning and construction by scientists, engineers and technicians on three continents, has captured the first light. The first pictures of the southern sky were taken by the 570-megapixel camera on Sept. 12. The Dark Energy Camera was constructed at the U.S. Department of Energy’s (DOE) Fermi National Accelerator Laboratory in Batavia, Ill., and mounted on the Victor M. Blanco telescope at the National Science Foundation’s Cerro Tololo Inter-American Observatory in Chile, which is the southern branch of the U.S. National Optical Astronomy Observatory (NOAO). With this device, roughly the size of a phone booth, astronomers and physicists will probe the mystery of dark energy, the force they believe is causing the universe to expand faster and faster. The Dark Energy Camera is the most powerful survey instrument of its kind, able to see light from over 100,000 galaxies up to 8 billion light years away in each snapshot. The camera’s array of 62 charged-coupled devices has an unprecedented sensitivity to very red light, and along with the Blanco telescope’s large light-gathering mirror (which spans 13 feet across), will allow scientists from around the world to pursue investigations ranging from studies of asteroids in our own solar system to the understanding of the origins and the fate of the universe. Scientists in the Dark Energy Survey collaboration will use the new camera to carry out the largest galaxy survey ever undertaken, and will use that data to carry out four probes of dark energy, studying galaxy clusters, supernovae, the large-scale clumping of galaxies and weak gravitational lensing. This will be the first time all four of these methods will be possible in a single experiment. The Dark Energy Survey is expected to begin in December, after the camera is fully tested, and will take advantage of the excellent atmospheric conditions in the Chilean Andes to deliver pictures with the sharpest resolution seen in such a wide-field astronomy survey. In just its first few nights of testing, the camera has already delivered images with excellent and nearly uniform spatial resolution. 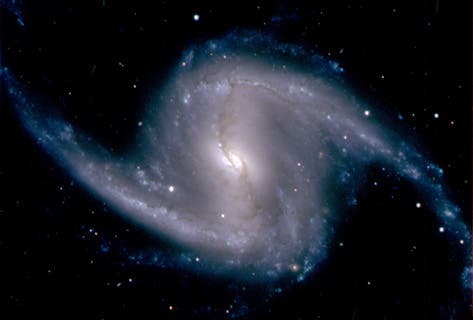 The Dark Energy Survey is supported by funding from the U.S. Department of Energy; the National Science Foundation; funding agencies in the United Kingdom, Spain, Brazil, Germany, and Switzerland; and the participating DES institutions. 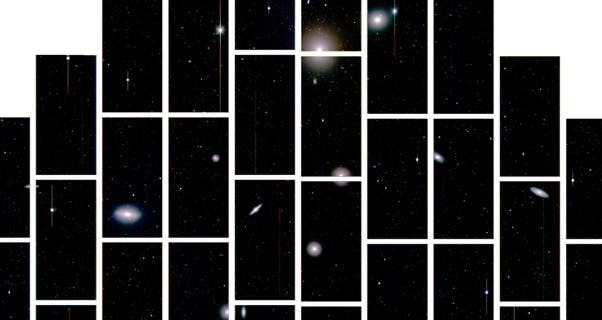 The zoomed-in image below from the Dark Energy Camera shows the Fornax cluster of galaxies, which lies about 60 million light years from Earth. The Daily Galaxy via http://www.fnal.gov/pub/presspass/press_releases/DES-DECam-201209-images.html or http://www.noao.edu/news/2012/pr1204.php. Image credits: Credit: Dark Energy Survey Collaboration.